I have tried various products like – Evernote, Gnote etc. to store notes which I needed to access quickly . But was not really impressed. Another money saving App for UK Mobile users. I have been using this for more than an year. Calling 08 numbers from mobile phones are never included in the allowance. This is a brilliant way to get around it with an additional feature of this company waiting in Queue for us. This company was featured in the Dragon’s Den once. WeQ4U is a FREE Android/iPhone App and Service that puts you through to UK 08 numbers for FREE, without queueing. with WeQ4U, whether they encounter a queue or not, so it saves you money and time. Not got Android or iPhone? To use it, Just dial 0333 5432111 and enter the number of the call centre you wish to reach. We’ll dial for you, and connect you to the call centre. Once you’re in a queue for an agent, just press 9* to disconnect your phone from the call – that’s 9* to wait off hold. Have you ever thought of sending a link from the Chrome browser you are using on a computer to mobile ? Google Chrome to Phone Extension enables you to send links and other information from Chrome to your Android device. This extension adds a button to Chrome that lets you seamlessly pushes links, maps, and currently selected text and phone numbers to your Android device. 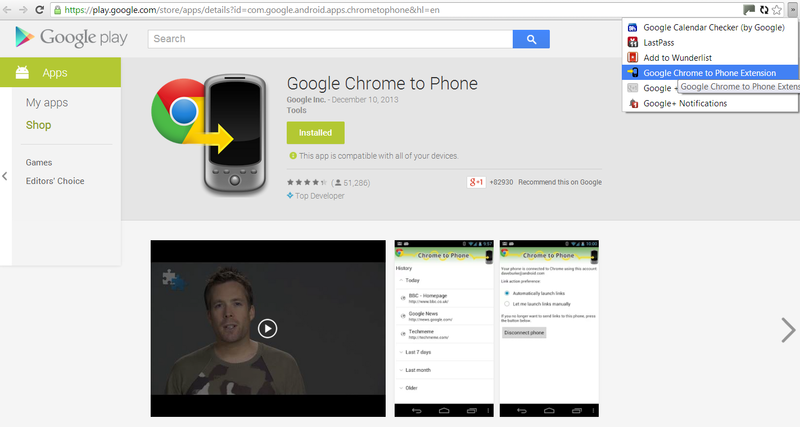 You also need to install the Chrome to Phone Android application on your phone.